Zotero (http://www.zotero.org/) is a free Firefox plug-in for recording and organizing bibliographic information about Web pages, images, and online journal articles, and bibliographical information not online. Zotero enables export of selected references as a formatted bibliography text file in recognized writing styles such as APA and MLA, or custom reference styles. Zotero is a research tool that leverages the concept of tagging. Zotero can extract key metadata from Web pages and insert them into citations. In addition to collecting metadata, Zotero organizes user-generated information including snapshots, images (e.g., from Flickr), notes, attachments, tagging, and related items. Zotero is a tool in which students can learn both research and Web 2.0 skills. 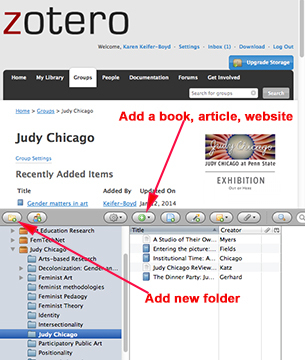 In this course, please join the Judy Chicago group at https://www.zotero.org/groups/judychicago. Once in the Judy Chicago group create a folder or contribute to an existing folder within the group set up for the course to collaboratively build knowledge about the emergent themes of the course. You may also create a new collection. 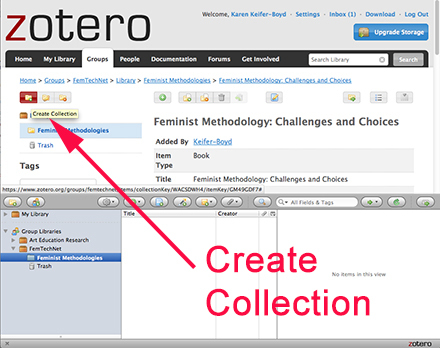 Zotero: Collaboratively Create Research Bibliographies (click here on how to begin or register for a workshop at the library). Set goal for creating a bibliography, identify a minimum of 5 keywords important to you to tag resources, and articulate this as a blog entry due 1/24. Set up at the minimum 1 topic in Zotero, tag and add to others’ topical reference list on Zotero throughout the semester (due 5/1).